TheTravelzine Italy 2007 - Arezzo. The Province of Arezzo, located in the easternmost part of Tuscany, is one of Tuscanys best kept secrets. The north-eastern part of the province is mountainous with four valleys; Valdichiana, Valtiberina, Valdarno and Casentino and two rivers (Arno and Tevere). We were about to discover why this area should become part of a visit to Tuscany. The low hills of the western part of the province are covered with grape and olive groves while the lowlands of the south bathe in sunshine. The city of Arezzo is situated on a hill that rises gently in a fan shape from the city gates to its highest point. As you ascend it goes from its more modern era to its ancient medieval beginnings at the peak where the Cathedral, City Palace and Medici Fortress are surrounded by trees and parks. The stazione (train station) is just outside the gates. Straight ahead is the Corso Italia, the wide main street that runs up through the center of the fan all the way to the top of the hill. We walked up Via Madonna del Prato, which runs parallel to Italia, and becomes Via di S. Francisco and then Via A. Cesalpino which throughway is the other main artery to the top. As we approached Via Cavour at its intersection with Via S. Francisco, we had to carefully weave our way around the corner through the crowd. 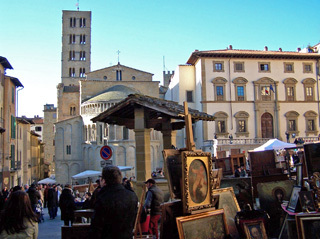 It was the first Sunday of the month when Arezzo hosts its famous Antique Fair. From its center in the nearby Piazza Grande (also known as Piazza Vasari), the antique fair spills onto the surrounding streets and squares. This is no ordinary street fair; this is a serious historical event with offerings for average shoppers and professional dealers alike. Sundays are usually very quiet days for visitors in any city but this is an exception. 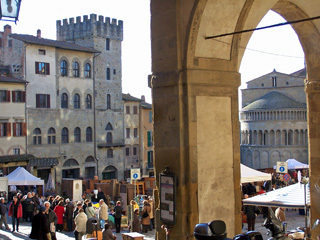 Plan to stay in Arezzo the weekend of the first Sunday of the month. Our destination was Via Cavour, 23, The Hotel Patio, a transformed historical palace, which is perfectly located in the center of the city. The large entryway leads to the reception area where the owner and her staff welcome their guests. A wide stairway leads to the seven rooms and suites which surround an atrium. There is no elevator but the staff will gladly carry your luggage to your room. Each room and suite is dedicated to one of Bruce Chatwin's famous books and decorated with original furniture and furnishings from the country it represents. Ours was "Ouidah", from "The Viceroy of Ouidah", a short story of tropical madness and cruelty. The Viceroys nickname was "The Elephant" so the frame of the large wall mirror is decorated with small elephant heads. A wooden, beamed ceiling, a bed with a wrought iron headboard, wicker tables and chairs, a wooden armoire, walls painted bright yellow and cherry red with bedding and drapes to match, and a combination of old lighting fixtures mounted on carved wood plaques and modern wall spot lights completes the funky decoration. The golden bathroom was a good size with a stall shower. Both the bedroom and bathroom had windows opening to the atrium. A very good breakfast buffet is served in the charming ancient cellar. Arezzos Antique Fair, the first of its kind in Italy, was founded in 1968 by antique dealer Ivan Bruschi who had the passion to unite his love for antiques with his town of Arezzo. His devotion to his profession and chosen cause led to Arezzo and the region becoming a well-known destination for antiques of all kinds, an economic success story. One of Arezzo's most elegant 13th century civil buildings, Palazzo del Capitano del Popolo, at Corso Italia, 14, where Ivan Bruschi lived and worked, was beautifully restored to house his prized possessions. He established the Ivan Bruschi Foundation to fund his legacy. La Casa Museo di Ivan Bruschi, now open to the public, is another significant reason to visit Arezzo. This extraordinary collection of archaeological treasures, jewels, ceramics, paintings, furniture, glassware, weapons, books, porcelains, ivory, etc., is lovingly presented on three floors. We were captivated by Bruschi's vision, just as he would have wanted. Across the street from Casa Museo Bruschi is the parish church Santa Maria della Pieve, the largest Romanesque church in the Arezzo region. Its 60m tower "of one hundred holes" (because of its double mullioned windows) is one of emblems of the city. 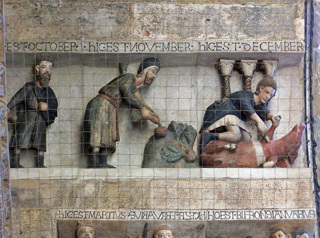 Under the front arch is the marvelously preserved full color sculpture, "cycle of months", worth craning your neck to see. In contrast to the sumptuous decoration of the facade the interior is quite stark. Corso Italia was packed with folks hauling their antique acquisitions, shoppers who preferred new fashion to old stuff, gelato lovers and folks like us, taking it all in and exploring the streets and squares appreciating the city design and architecture. It's a terrific walking city with surprises around every corner. Via Cavour, which runs through Piazza S. Francisco, is the main cross street through the center of the city. Piero della Francesca's brilliant frescoes Leggenda della Vera Croce (Legend of the True Cross) are in the church of S. Francisco. This piazza is immortalized in the film "Life is Beautiful". We headed to the lower part of town to visit the Anfiteatro Romano (Roman Amphitheatre) and Archeological Museum at Via Margaritone. Enough remains of the amphitheatre to visualize what it had been even if much of the original stonework was taken to build the Cathedral. In the summer it becomes a venue for concerts. The Archeological Museum, in a former convent, contains marvelous collections of gold jewelry, 6th century Etruscan terracotta and bronze work, the famous "coralline vases" made in the local red vase factories with the insignias of the manufacturers, mosaic sections of floors and pavements, sculptures, remains from tombs, ceramics, weapons, with private collections in separate rooms. Arezzo once had a thriving gold manufacturing industry employing about 1000 workers in a few establishments but the business became more fragmented as employees left and started their own businesses. Behind S. Maria is Piazza Grande, the heart of the city, surrounded by a compilation of architectural styles, Romanesque, Gothic, renaissance and baroque. The Gothic and renaissance facade of the Palazzo della Fraternita, the 18th century Palazzo del Tribunale and the 16th century Logge del Vasari are joined by two noblemen's tower houses of the 14th century and ordinary 13th century houses bringing harmony to the great square. It's particularly famous for hosting the "Giostra del Saracino" (joust of the Saracen) on the third Sunday of June and the first Sunday of September every year. It was late in the day as we made our way to the Duomo, the bold Gothic Cathedral at the summit. 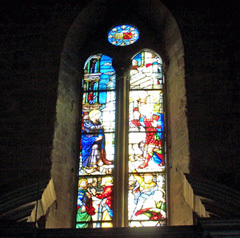 Particularly significant are the striking stained glass windows by Guglielmo de Marcillat and Piero della Francesca's "Magdalen". We found our way to Piaggia S. Martino 8, just off Piazza Grande, La Torre di Gnicche, an enoteca and restaurant. It's a 7 table wine bar with typical local food offerings. After a day of walking it was a delight to sip some light fruity house rosso and nibble on fette croccanti, one with melted scamorza another topped with pomodoro and funghi. This was followed by two marvelous soups. Pappa con pomodoro, thick and rich with tomato, onion, garlic, olive oil and sage (basil is substituted in the summer) and traditional ribollita was as good as this favorite gets. The two mains of polpettone (meat loaf) al vino rosso and maiale arrosto con patate were somewhat disappointing after the exceptional soups but very good ricotta and pear tarte was a nice finish. Stick with cheeses, meats and soups and you will be well served. If youre planning to be in the vicinity between March 31 and July 22, 2007 you should get to Arezzo to see the exhibition, "The Majesty of Piero: Piero della Francesca and the Italian Courts. Over 100 15th century masterpieces will be displayed including the works of Piero della Francesca and other great artists of the time. Arezzo is an endearing city to explore. Speaking of exploring, today we were off to do just that in the valley and mountains of nearby Casentino. We had met a well known artist and writer, Giovanni Caselli in Toronto last fall and he had invited us to spend a day with him to get a taste of The Casentino where he resides. He has written and illustrated a wonderful book, "Casentino, Its History and Environment in 58 Walks. Train tickets for the private line that runs to the Casentino region are sold at the Tabacchi in the stazione, not at the regular train windows. It was a 44 minute ride to Bibbiena, the administrative center of the Casentino, where we met Giovanni and his friend Alessandro De Vivo, the artist. There are no major highways to disturb the beauty and tranquility, just good local roads that wind around the mountains and through the valley. It did not take us long to appreciate why the Casentino has always been an inspiration for artists with its mountain landscape dressed in thick forests of beech and chestnut trees. Agriculture, particularly grains and pig farming, is the main industry. This environment has led to a growing network of agriturismi. We stopped at one such farm, Fattoria Corsignano, a magnificent property, surrounded by mountain views, lush landscapes, attractive stone buildings for lodging, restaurants, meeting and banquette halls with patios, pools, and lounging areas and room to roam. We headed to the land of Michelangelo's birth. In 1913 a royal decree established that he was born in Caprese, but for centuries before it was believed that he was born in the Castle of Chiusi, some 12km away, where Lodovico, his father, was residing at the time of his birth. The village of Chiusi della Verna sits on high between Casentino and Valtiberina. In August 1995 the European Cultural Association "Michelangelo" completed the first stage in restoring the 12th century building which was the seat of the Potestery (Mayor) of Chiusi della Verna and of the law court. The restoration is now much more complete thanks to efforts of our guide Alessandro De Vivo and his wife Mara. When finished the Potestery will be a cultural center. The Potestery is next to the Castle of Count Orlando Cattani who allowed St. Francis of Assisi to settle here in 1213. 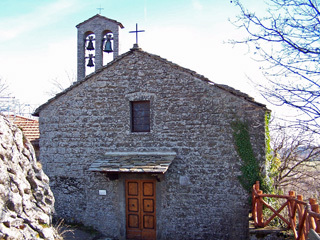 In 1300 a small church was built and named St. Michael Archangel. It was established to honor the then local Podestà of the Florentine Republic, Lodovico Buonarroti. When his son was born he was baptized "Michelangelo" in the church. The fact that Mount La Verna was represented in Michelangelo's Tondo Doni, the Crucifixion of St. Peter, the Conversion of St. Paul established a link between the artist and this place. Further, he represented Adam about to receive the Divine sparkle lying on the very rock next to the house in which his father resided when the artist was born. Wanting to depict "earthly paradise", Michelangelo drew his inspiration from this place and for this reason his Adam's Rock and Mount La Verna are seen in the central arc of the Sistine Chapel. The news of the discovery of the view from the rock became official on Oct. 2, 2004 and in the summer of 2005 the exact view was found to be obtainable from right in front of the Potestery. It was a cultural and artistic inspiration to experience the view and the feeling of being in the place where the great Michaelangelo lived and worked. To top it off we were invited to have lunch in the Antica Podesteria (Ancient Potestery) prepared by the lovely and talented Mara De Vivo who besides proving she knew her way around the cucina, entertained us with her delightful singing. The Art and Tourism Association offers 20 itineraries and customized tours to discover the region and the life of Michelangelo. Lunch at the Potestery is usually included which will allow you to feast, as we did, on the likes of crostini with cheese and funghi and sausage, hand made gnocchi with ragu, fallow and red deer stews, polenta and dolce with Vin Santo. After overnighting in Arezzo, we were off to Cortona in the morning.